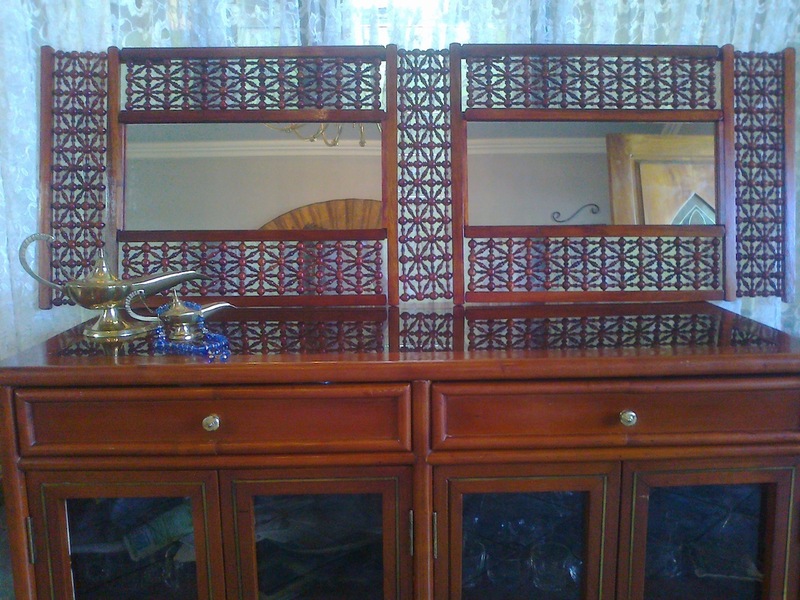 Fretwork in Egypt is about as old as the pharaohs. Several beautiful pieces of furniture decorated with delicate fretwork were among the treasures found in Tutankhamon’s tomb. Moorish fretwork was brought to Spain by the Arabs and greatly influenced spanish architecture. 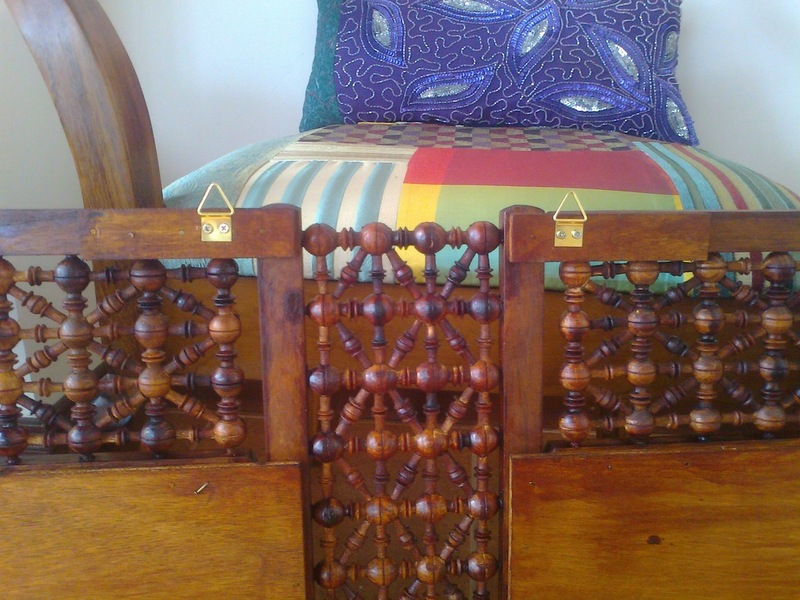 Traditionally, fretwork shutters have been used on windows in Middle Eastern countries to shield the inside of the homes from the curious eyes of outsiders. 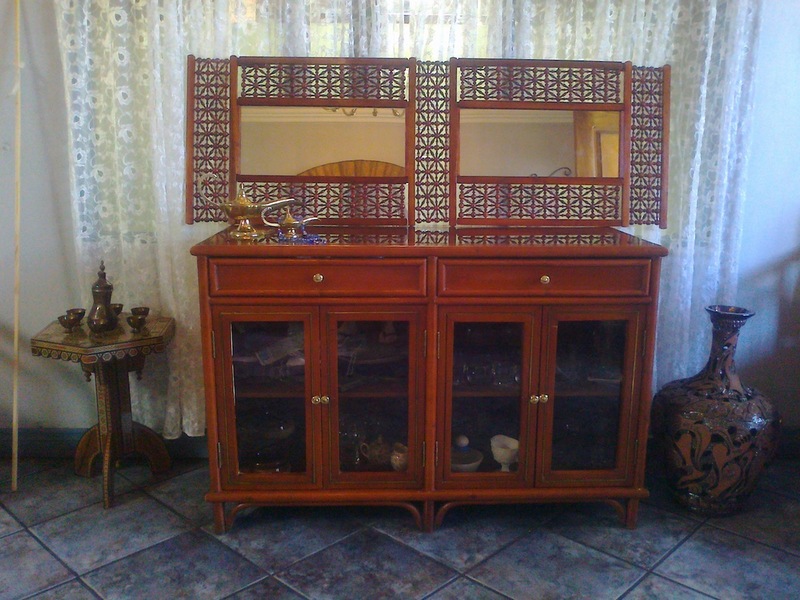 Today it is often used as a decoration on furniture, jewelry boxes, room dividers and mirrors. Different countries have different styles of fretwork but by far the most beautiful (in my opinion) is the one made in Egypt. It is called Mashrabiya in Arabic. Each individual piece that makes up the design is made by hand on a lathe. 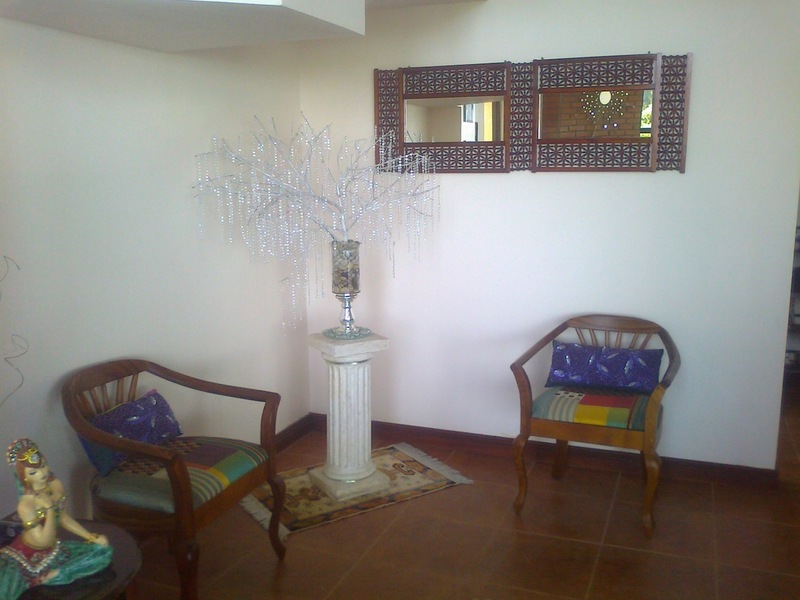 The pieces are then fitted together precisely to form interlocking lace-like panels that can be used in different ways. 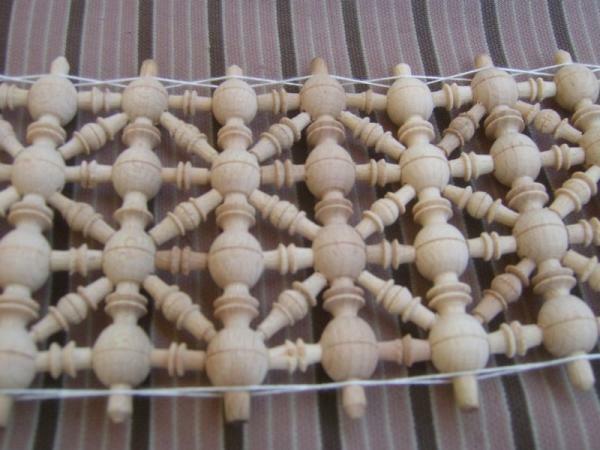 The pieces are not nailed or glued together, they are just fitted into grooves in much the same manner as tinkertoys are. I was thrilled recently to find a vendor on Ebay who was selling 5″ X 20″ inch panels of Mashrabiya for about 20 dollars each and I promptly ordered 7 of them. The only drawback was that they were held together with a length of string wound tightly all around the perimeter. 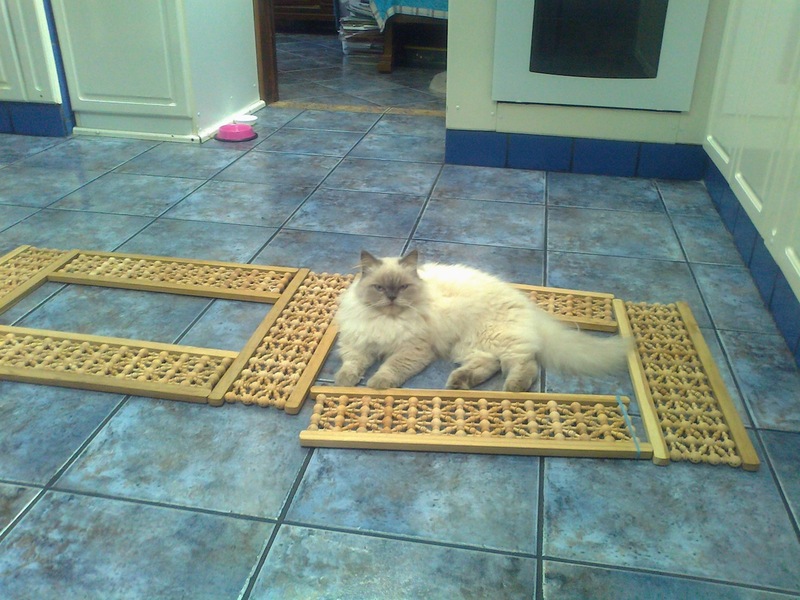 It was the only thing that held them in place, so if that string came loose the whole panel would come apart. I had to figure out a way to secure them and be able to remove the unsightly string. 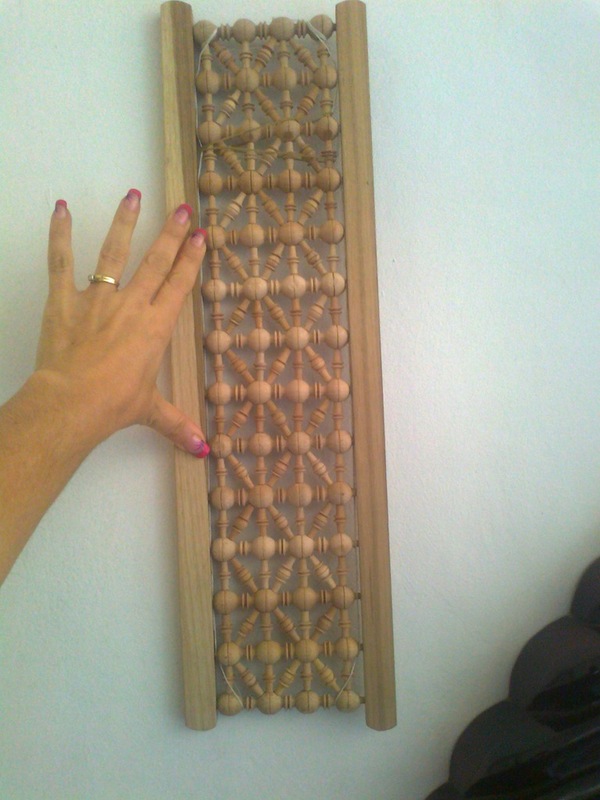 I bought several long thin wooden slats slightly longer than the length of the mashrabiya panels to use as frames. 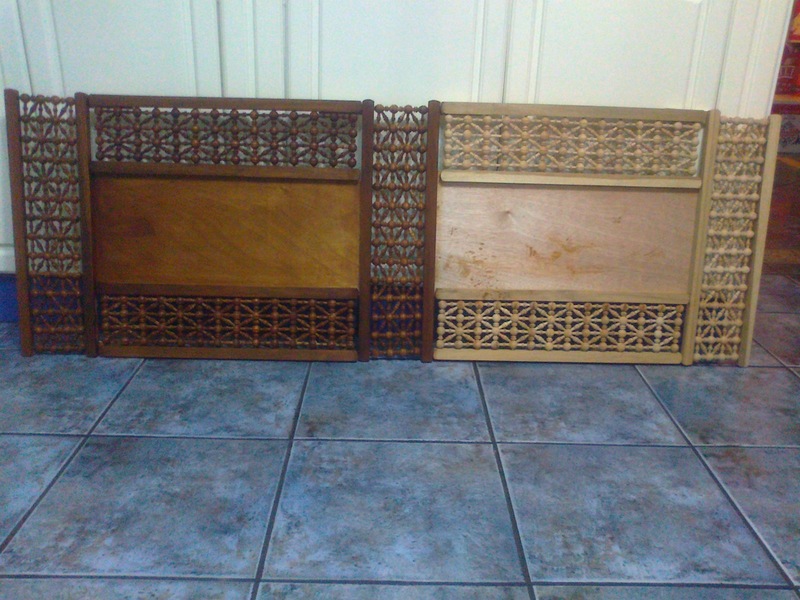 Then I measured and drilled holes into them so that the protruding knobs of the fretwork would fit into each hole. I wasn’t really sure if this was going to work but surprisingly it did. 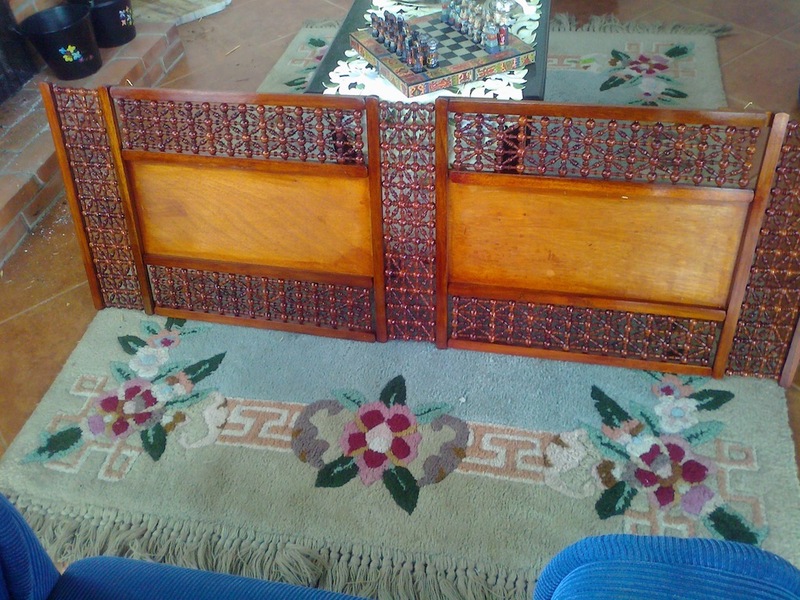 I filled each hole with Elmer’s glue and then pushed the little knobs of the mashrabiya panels securely into the holes. After the glue dried and everything was held firmly in place, I cut the string. 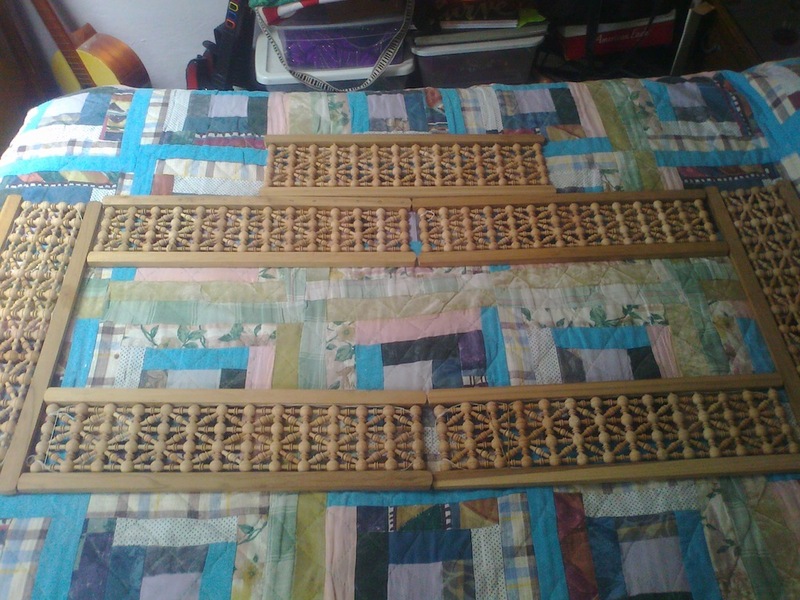 Now each piece was securely framed between the two slats. Semsema settled down for a nap as soon as she saw me laying out the pieces on the floor. I had to think about how I was going to do this, because I have absolutely no carpentry skills and I can barely hammer a nail into a piece of wood without bending it. I bought two rectangular pieces of thin plywood to use as a backing and after my neighbor (who is a carpenter, yay!) 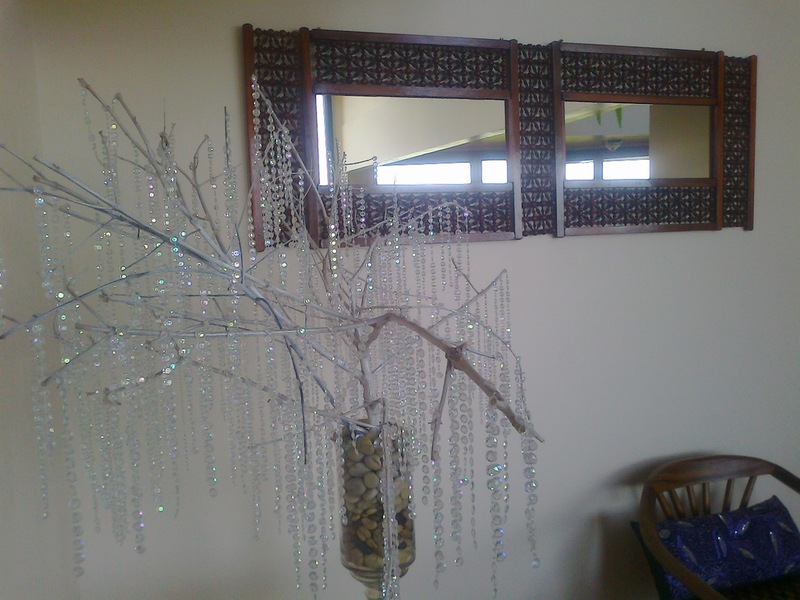 cut them down to size for me I nailed the mashrabiya panels to them. 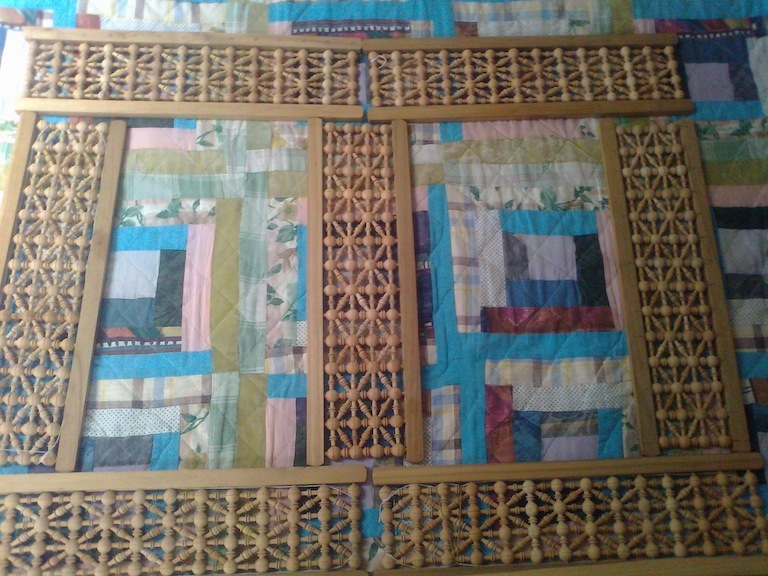 I nailed a mashrabiya panel to each side of the rectangular plywood pieces, connecting them all together to form one single large piece. This is the back side of it. Now it was time to paint it. I wanted it to be a rich dark color like the ones I’ve seen in pictures but I had no idea what kind of paint to use. I finally settled on a dark wood stain ( I actually found an almost full can of wood stain in our tool shed! What are the odds?) It seemed easy enough to use. 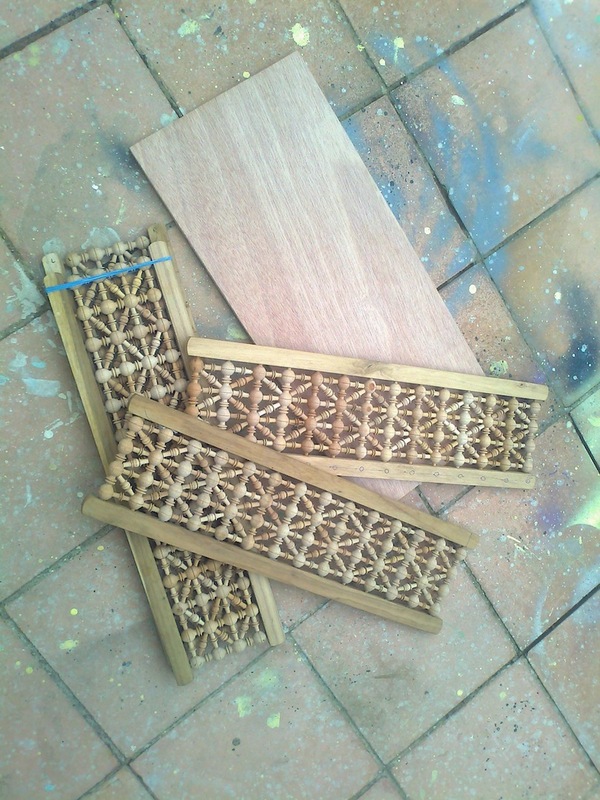 After reading the instructions on the can, I applied it to the fretwork with a small paintbrush, giving it two coats. Here it is after applying one coat of wood stain to half of it. After applying two coats of wood stain and letting them dry overnight, I applied two coats of spray varnish. I figured that spray varnish would be alot easier than putting it on with a paintbrush. 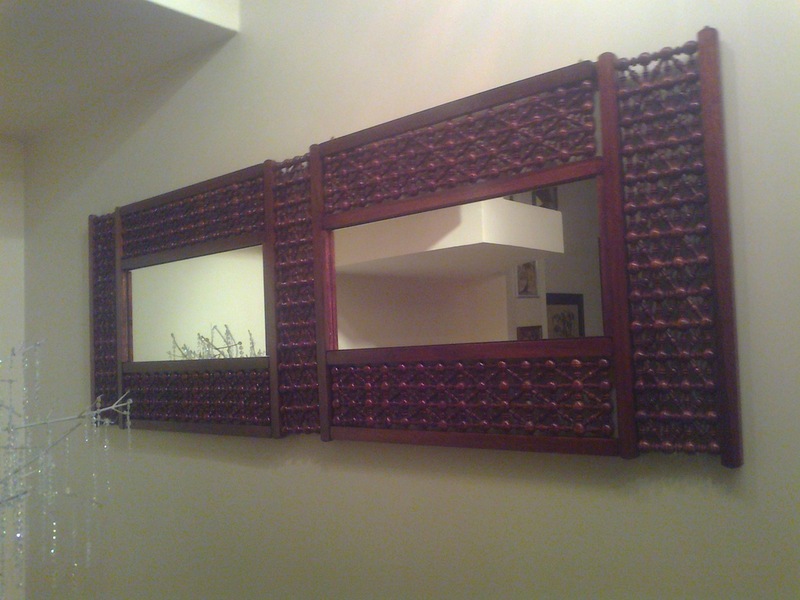 Next I purchased two rectangular pieces of mirror cut to size and secured them in with double sided mirror tape. And I screwed in four triangular brass hanging hooks to the back side. And I was done! Now it was ready to be hung on the wall. Really sooooo amazing and sooo pretty . teslam edeke , thx for posting it . Thanks Teric! 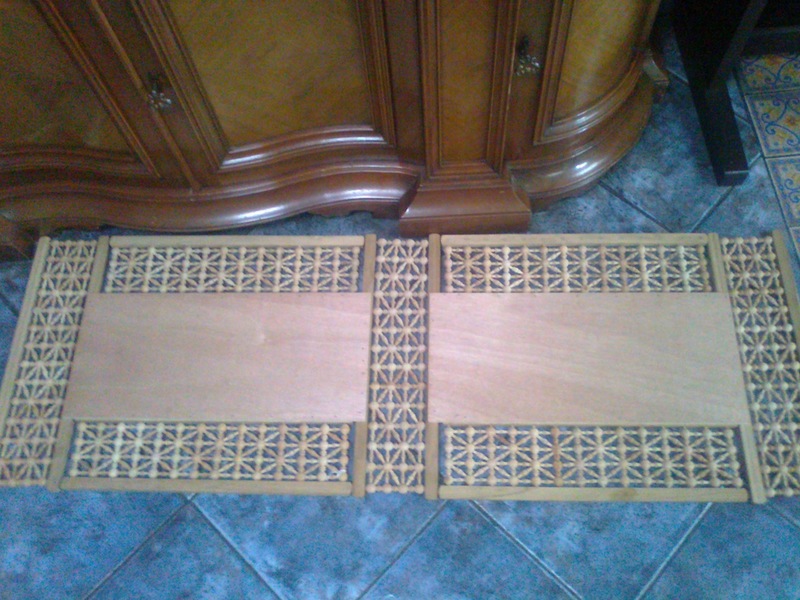 Are you making the table bases out of Mashrabiya too? Hi, I know this post is old, but I would love to find masherabiya panels like you found on Etsy–I’ve tried o search but can’t find them. Do you know the name of the vendor? 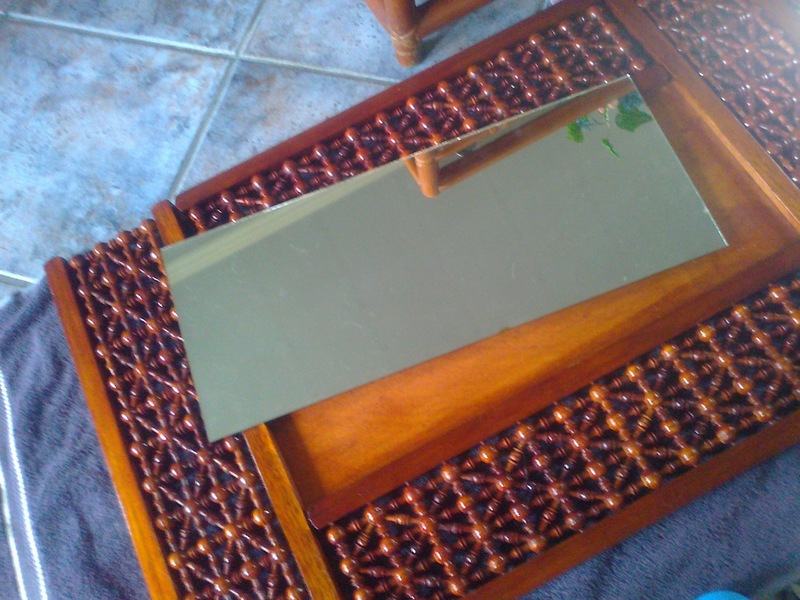 Thank you–your mirror is beautiful! 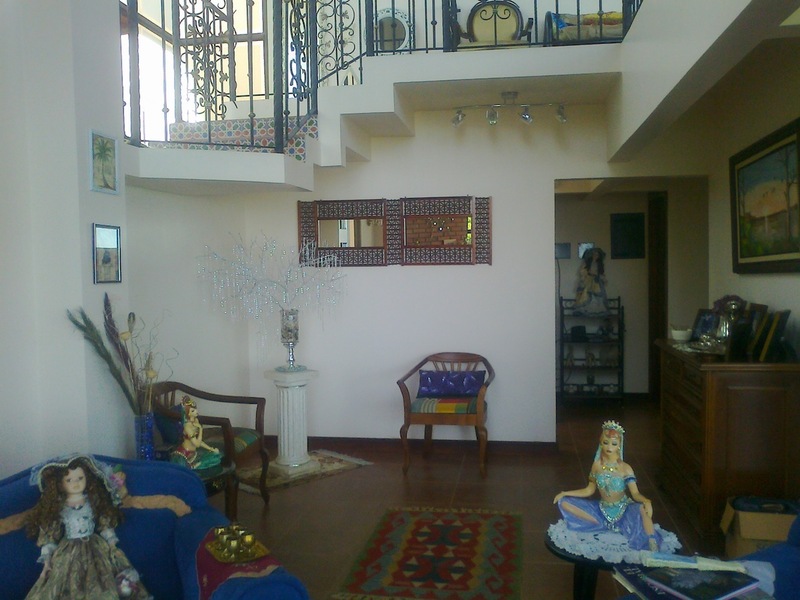 I lived in Egypt and have a special affection for the look of masherabiya. Any help in finding such panels is welcome.